Today I interview Barbara Lambert, fellow Tiny House Dweller. Learn a little about her adveture of building a tiny house and how she chose her 6 acres of paradise. 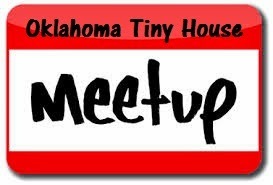 Yesterday was the first meeting up Oklahoma Tiny House Meet Up and I really enjoyed it. About a dozen of us Tiny House Enthusiasts met at a local coffee shop to talk "all things tiny." The group brainstormed about what we would like to learn or experience related to tiny houses and got to know each other. 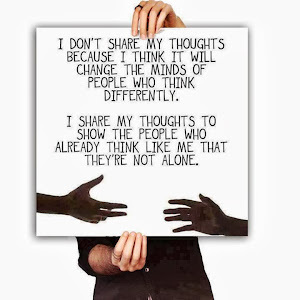 We each come from quite a diverse set of backgrounds, but all have a desire related to downsizing and healthy living. Our next Meet Up will be in January. What a great way to begin the new year! Know someone who lives in a small space? Limited space means practical, but awesome gifts! Here are some holiday suggestions for gifts that make sense for people who live in tiny houses or even those who don't. 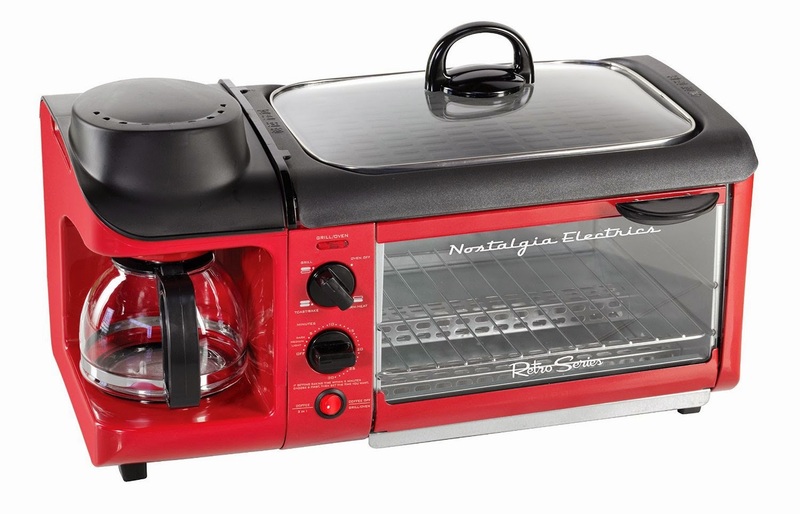 This coffee maker, oven, and griddle in one will multi-task and help you by combining multiple appliances into one practical and cool looking counter top unit. 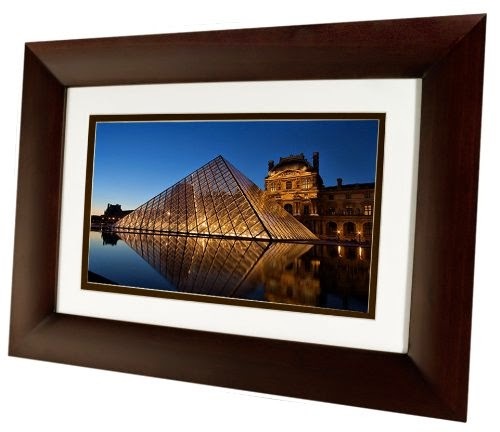 Digital photo frames are the modern day equivalent to all those photo albums you see at grandma's house. Thousands of photos will rotate reminding you of all the good times and places you have been. A bonus is it will function as a nightlight as well. 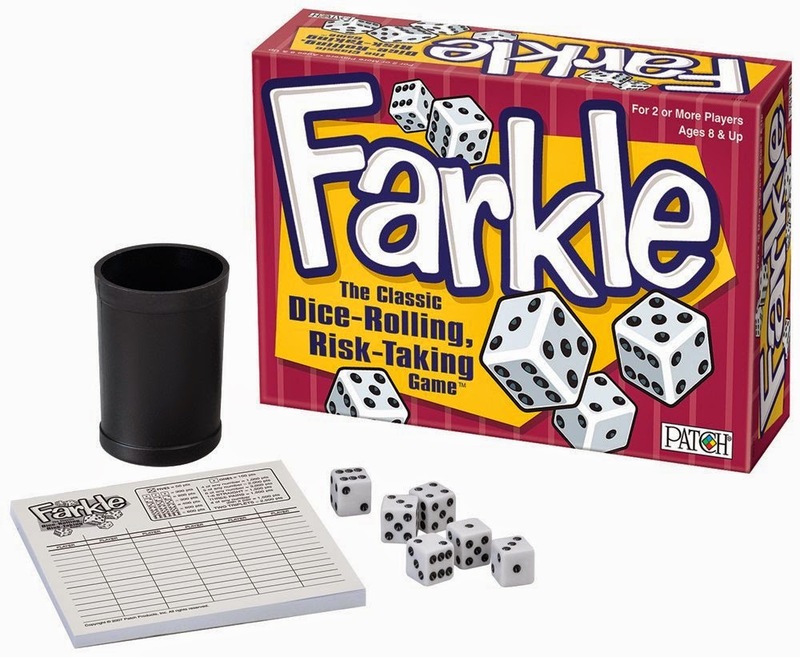 Dice games are great because they take up so little space. Dice are easy to replace if lost too! 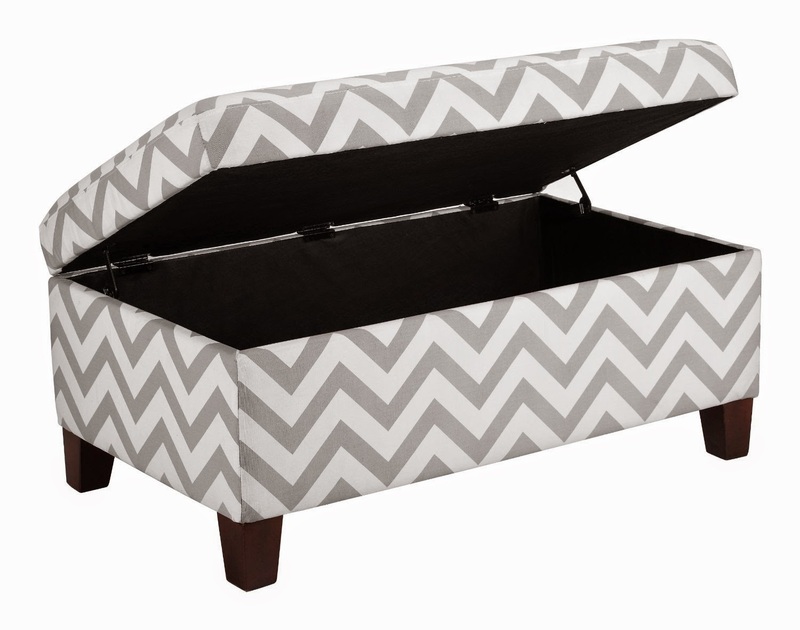 A storage ottoman allows for extra seating in a tiny house as well as storage for blankets, magazines, and such. Ottomans are very practical and attractive. 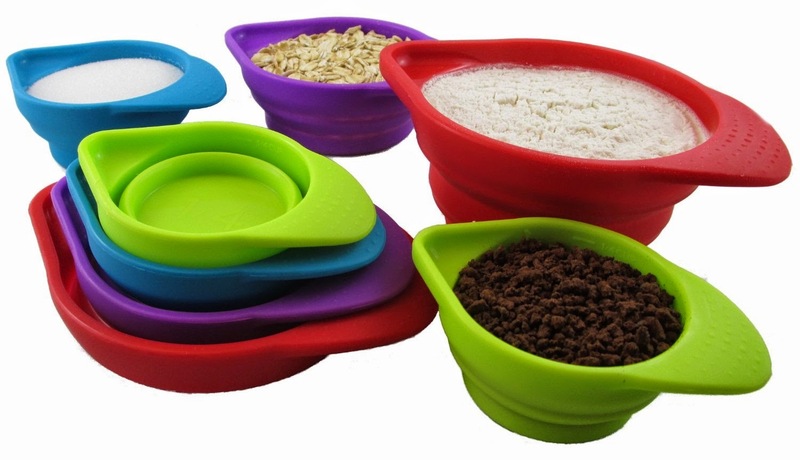 All kinds of collapsible kitchen goods are available these days. Collanders, measuring cups, measuring spoons, bowls, and more all will store with the smallest of footprints when collapsed flat. Silicone is super easy to clean as well! One of the things that is toughest in a tiny house is corralling important letters such as utility bills and where to store your car keys. 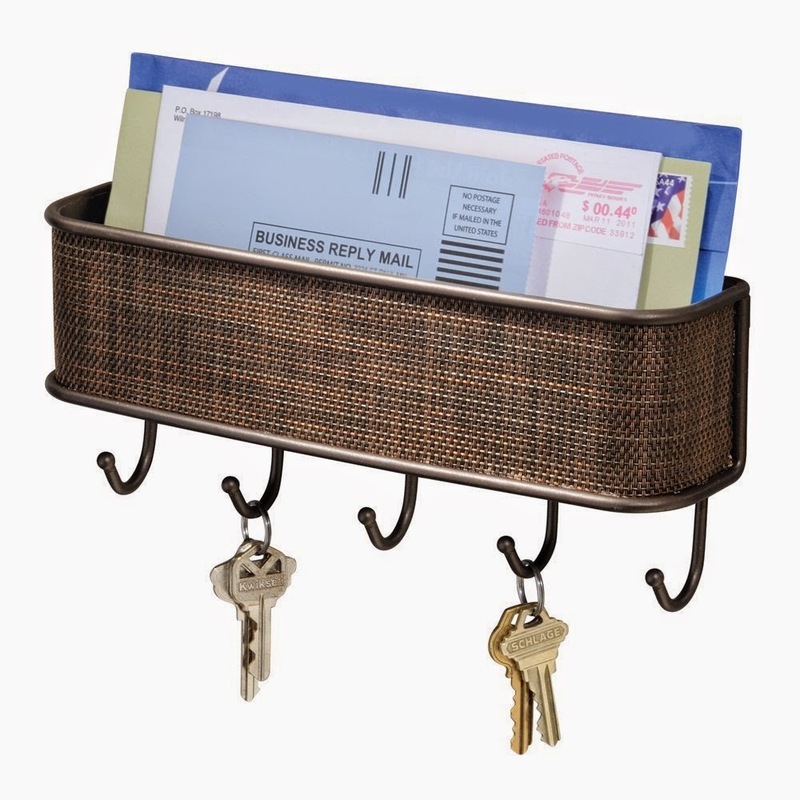 This attractive and practical shelf will take care of both dilemmas and make a convenient place to stick the mail and drop the keys as you enter with your hands full. 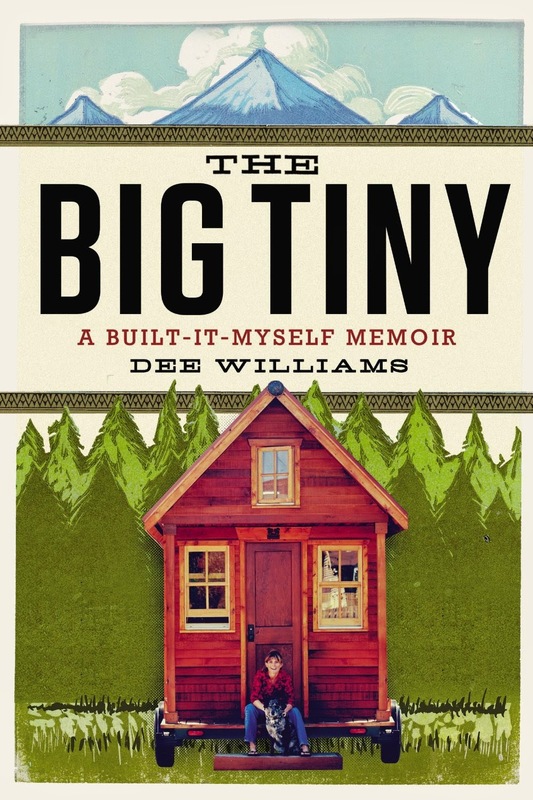 Dee Williams memoir talks about her adventure of downsizing her life to her tiny home. Building it by herself, Dee rose to the challenge and embraced a more simplified, far less stressful life. Dee is a power house in the world of tiny houses. 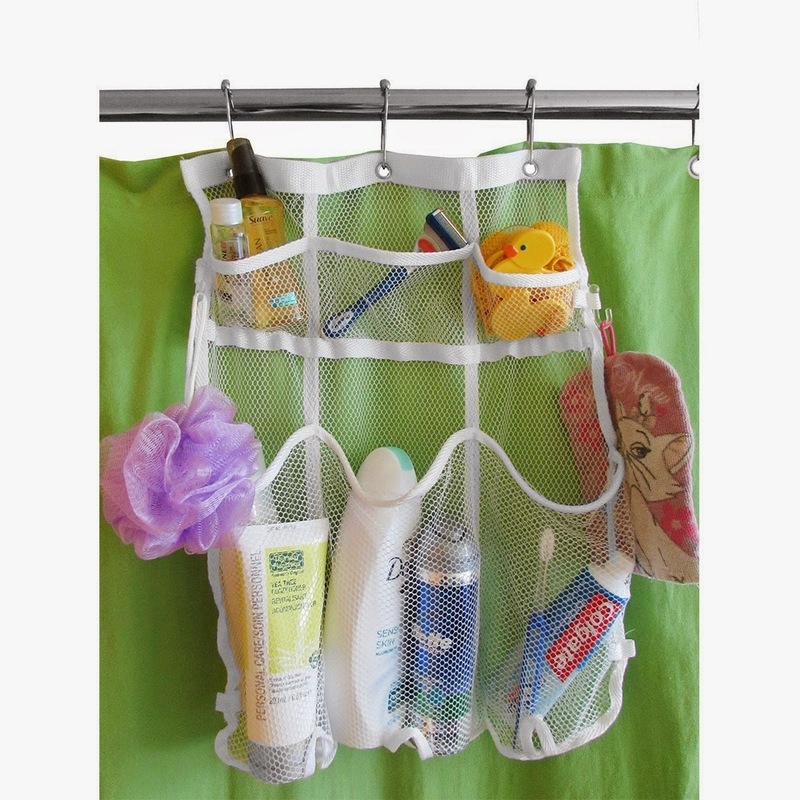 I love this shower caddy for a couple of reasons. First, I love that it is mesh which means it won't hold water and get mildewey. Secondly I love that it hangs on the curtain hooks instead of depending on useless little suction cups that never hold. This would be good for storing children's bath toys so they don't get icky. I adore this cutting board. 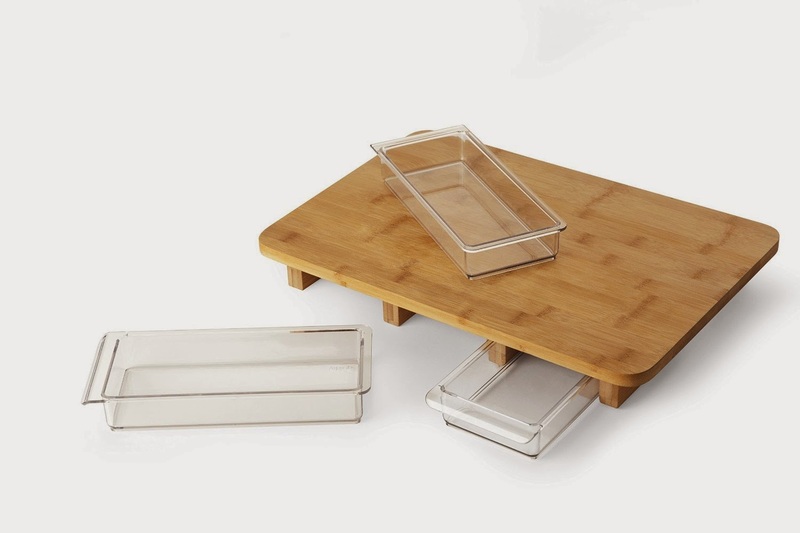 The drawers can be used for the food you prep or to store flatware, plastic baggies, etc. Every kitchen needs a cutting board. This one will earn its keep. Not the most personal of all gifts, gift cards allow the receiver to choose what they need for their tiny home. 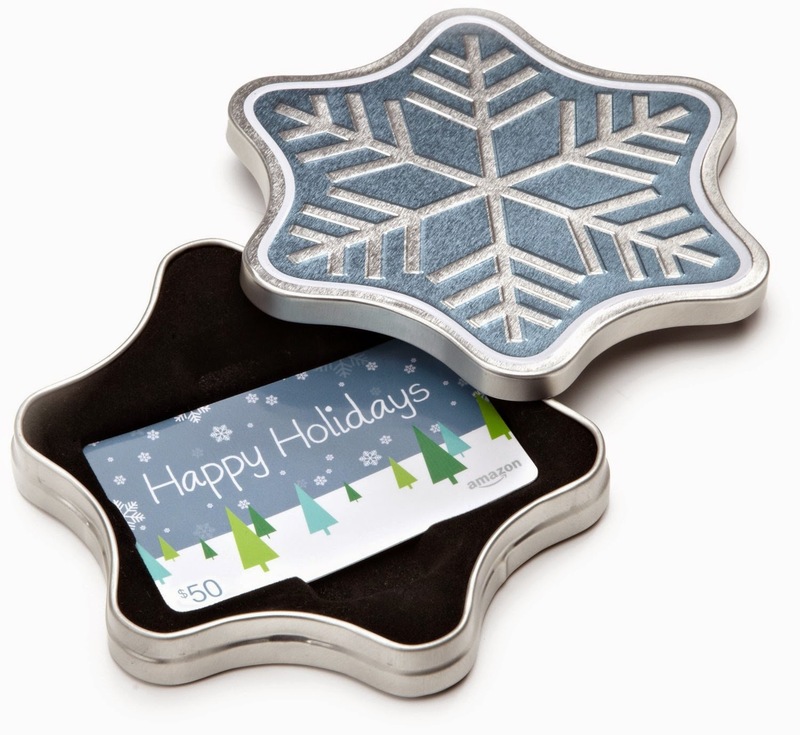 Try pairing it with a small token gift such as an oven mitt and kitchen utensil or with a mug and box of hot cocoa mix. All of these great items can be ordered online, so if you are like me and think Black Friday is just craziness, check 'em out. Most, if not all, are Amazon Prime eligible. It is snowing outside and that means it is 32 degrees or cooler. The wind is kicking up and my animals refusing to go outside. I don't blame them since it is a comfortable 70 degrees inside. I am maintaining the temperature inside with good old fashioned kerosene heat. 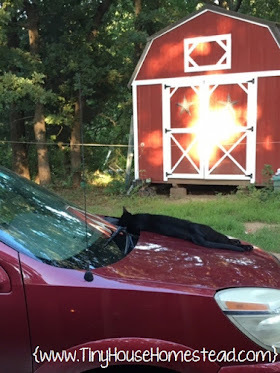 I did lots of research on the best and most efficient way to heat my home. I have already shared my rational for this when I wrote about the efficiency and costs comparing kerosene and Propane back in January of 2013. 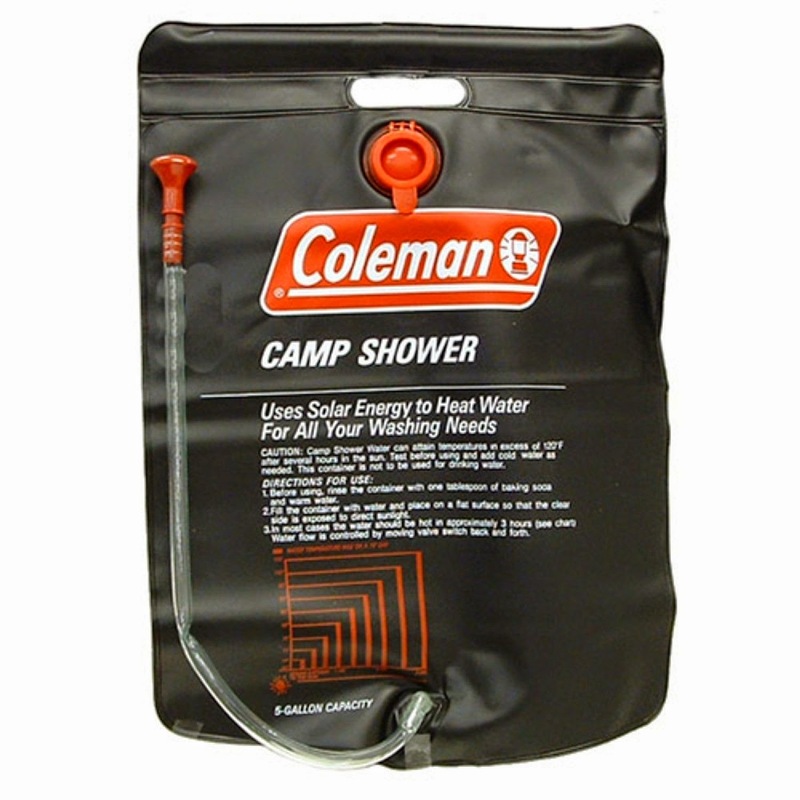 Here it the link: http://mytinyhousedream.blogspot.com/2013/06/baby-its-cold-outside.html.I broke down all the pros and cons and gave some great statistics about kerosene heat safety. Of course, the first thing that should be focused on when it comes to heating (and cooling) any tiny house is to make sure it is insulated effectively. Using a good insulation, installed properly, is key to keeping the house comfortable and the elements out. The higher the R value the better. 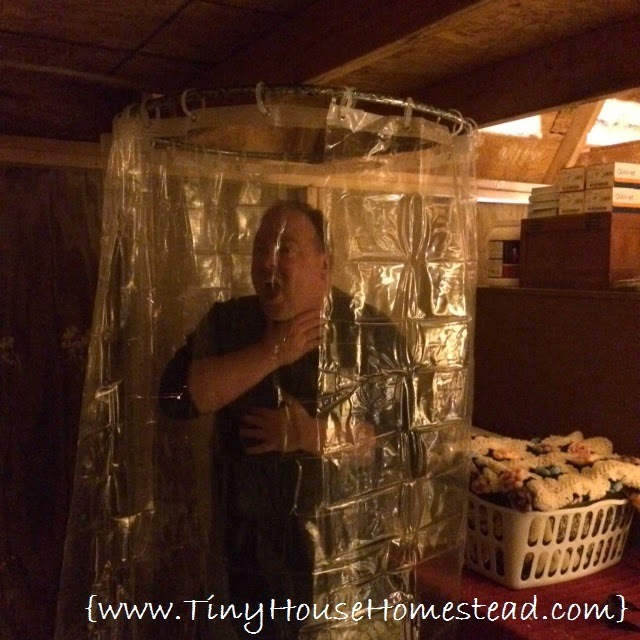 I used R13 in my tiny house and oh what a difference it makes. The difference between my building that is insulated and the one that is not is significant. Because each building is only about 325 square feet, heating them is really not difficult, but keeping the heat in is key to keeping costs down and the chill out. I put the time in as I contemplated different types of heating and explored all the pros and cons. Electric is common and portable electric heaters that will make a small space comfortable are relatively inexpensive and pretty safe. I considered using baseboard heaters because of their efficiency and ease of installation, however I needed to consider power outages. Here in the country power outages in the winter are common and can stretch from a few hours to several days. Last winter power was lost in my area for 3 full days. Depending on electric heat as a sole source of heat would be a mistake. I plan on installing baseboard heat in the bathroom when it is finished to keep it consistently warm, but I am not depending on electric heat to keep the house warm. I have decided to use kerosene heaters to supply the heat for my Shouse. Aladdin on left, Perfection on right. I have purchased three kerosene heaters. Two are modern kerosene heaters and one is a vintage Perfection heater. The modern models put out a comfortable 23000 BTU's of heat and burn for about 12 hours before needing to be refilled. The tank holds 1.5 gallons of kerosene and has modern protective features such as a wide base, auto ignite, and a wire burn guard cage. It is the most common style heater sold on the market today. I will be using those in rotation in the building I have not yet insulated. They will keep the bedroom and bathroom from getting too chilly and make sleeping in the building tolerable. The perfection heater will be used in the insulated building and will be the focus of this post. Perfection heaters were the equivalent and most popular space heaters available for over 65 years. Kerosene delivery in cities was done by truck and you simply brought your containers out to the truck to be filled. Trucks stocked brand new Perfection and similar style heaters that sold inexpensively. Marketing similar to cell phones today, kerosene companies were eager to sell you a product that would make you dependent on their product to keep it working. Recurring customers was an excellent business model then and is it is still today (just ask the CEO of any cell phone service provider). 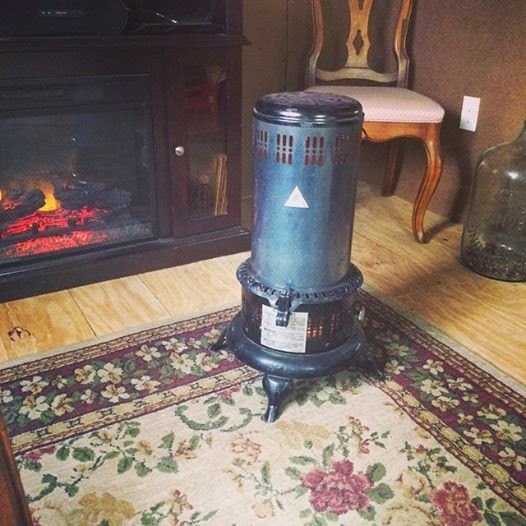 The Perfection heater is easy to use, portable, and throws off about 10000 BTU's of heat. 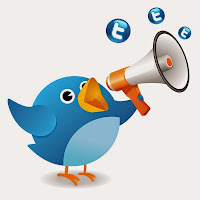 It is super simple in design and equally as easy to use. There are very few parts to the Perfection heater: the outside, the font, the burner, the flame spreader, and the wick. The font is filled with kerosene, the flame spreader extended all the way up, the wick lit, and the outside helps disperse the heat. All things being equal, the Perfection heater will heat a space for 8 to 10 hours. The Outside of my Perfection heater is painted black and has chrome accents. They also came in and Robin's Egg Blue, a cream color, and a brown. Mine is is great condition, but many of not survived as well. I suppose they could be restored using high-heat paint, but many tried to restore them just using modern spray paint. Beware of restored models because if they are not painted with high-heat paint, the paint will smoke and then burn off the first time you go to fire it up. High-heat paint is sold at most hardware stores and even some big box stores. 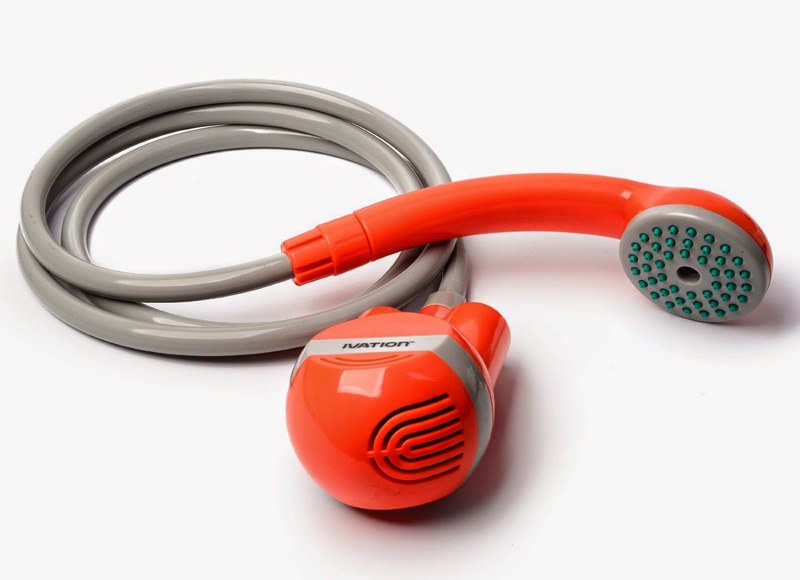 To clean the outside of the Perfection heater just use a soft cloth and some window cleaner. I vacuum out the vents with my vacuum to prevent dust from building up and to clean out any cobwebs after it has been stored during the summer. The font portion of the Perfection heater is really the workhorse. The font is what holds the kerosene, the burner, the flame spreader, and the wick. It controls the amount/speed of burn and thus the amount of heat that is produced. My font has a clever little gauge which helps me to see how much fuel is left inside. It is actually a cork and it pushes the indicator up and lowers it as the fuel burns. The flame spreader regulates how far up the wick is extended while burning. The wick is turned up until the flame spreader prevents it from being turned up any higher. This is the ideal burning height. The beauty of a Perfection heater is that while the outside may have changed in style, decoration, color, etc,, the insides did not. The simplicity of its function has been carried across the close to 100 years it has been around. Millions of Perfection and similar style heaters were produced over the last century. They are not "rare" as many ads like to state or imply, so take your time if you are looking to buy one. Units should not be over $100 unless they are in fantastic condition. They weigh less than 10lbs, so shipping should not be too high. Kerosene heaters are a good way to heat a small space and are excellent to have to back up electric heating. Just remember to maintain your unit and don't leave it burning unattended. Now I think I will get a cup of hot coco and watch the snow fall from the warmth of my living room. Stay warm! All ingredients are in the crock pot. Now to slow cook all day. Summer is over. Officially over. Our highs this week hovered around freezing. Thursday the weather reporters put out the word a hard frost was heading our way. That means get the rest of the vegetables out of the garden. My good friend Sharon and her husband brought me a bunch of produce from their garden. I am so grateful that my friends think of me when they have extra bounty. There is nothing quite as good as home-grown fruits and vegetables. Today I am using the rest of the green beans up by adding them to my stew. The great thing about stew is that you can add this and that, customizing your stew each time you make it. Brown the meat. Add it and all the ingredients to the crock pot and cover with water. Give it a stir with a wooden spoon and let her slow cook all day. Enjoy the lovely aroma of warm and hearty food cooking. Just before serving add a thickener if so desired. I add a 1/2 cup of water mixed with corn starch to thicken my stew, but I have also added powdered/freeze dried mash potato flakes (as is my plan tonight). Serve with warm biscuits or fresh, hot bread with butter. Winter is the perfect time to experiment with hearty and filling foods. It can only get better when you are using fresh veggies from the recent harvest. Time to get Twitterpated Tiny House style! The weather has changed. 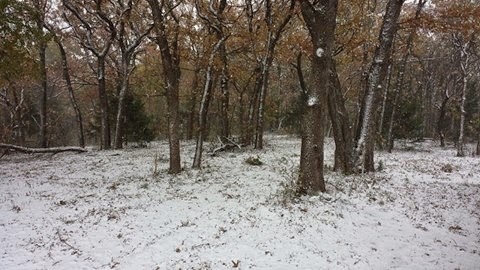 Old Man Winter has made his way into my neck of the woods. It was a chilly 22 degrees this morning and I don't think it will get much above freezing for this entire week. When the weather changes like this I like to have dinners that are warm and filling. 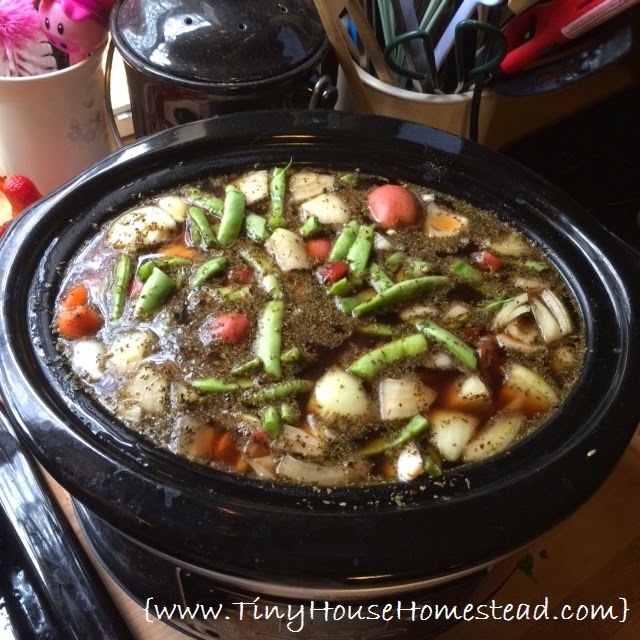 15 Bean Soup made in the crockpot and served with fresh baked bread is just the ticket to beating the chill. This soup is one that morphs over time of trial and error. Sometimes I change it up by changing the ham to bacon ends or even add chicken instead of ham. I used a can of Rotel this time that added a spicy kick, but you can make it without the peppery flair. Really it is an adaptable recipe with a few core components. The best part of this easy recipe is that it is made in a slow cooker so you don't have to fuss with it. Just put all the ingredients in and enjoy the wonderful aroma all day. Stir it once or twice if you are around just to see all the great colors of the beans, but if you cook it while you are out running errands or at work, it will still cook just as well. Serve it with a nice loaf of freshly made bread with butter and a side salad for a complete and healthy meal. Effortless dinners that are easy to cook and satisfying are the very best in my book. One of the best things about this recipe is the left overs can be used for lunch the next day or another meal. Repeats your can't beat! Now just allow time to cook. RINSE your beans under running water to wash.
ADD the beans to the cooker and then cover with water. Make sure there is EXTRA WATER to allow the beans to absorb without the risk of the pot drying out. DO NOT ADD THE TOMATOES JUST YET. CUT the meat you wish up into chucks. ADD to water/bean mixture. SPRINKLE in a little salt and pepper. COVER and allow to COOK for 5 hours or UNTIL beans are done. DRAIN Rotel or Tomatoes and ADD them to the pot. STIR and allow one more hour to cook. Add water if needed. SERVE with fresh bread or rolls. Serves 8 people. This soup is economical and feeds a large family with ease. This would also be a great soup to share at a potluck or with those in need during the cold season. Freeze some for future enjoyment and just reheat it in your microwave. Easy peasy! Enjoy and stay warm! So many folks ask me to explain to them how I converted a shed building into a home. There are two specific areas that most are really interested in: The bathroom and the kitchen. Today I thought I would show you a bit of my kitchen and answer some frequently asked questions. Q. What do you do for a kitchen? A. I have a regular kitchen with regular things such as a sink, stove, and refrigerator. I have shelves with dishes and lots of food storage. I even have a table that can seat six for a holiday meal. If you have it, most likely I have it too. My kitchen is cozy and functional. Q. How do you cook? A. I cook in a couple of ways. First, I have a propane cooktop. It is great for frying, boiling, etc. Just like your cooktop, only I have just two burners instead of four. Secondly, if it requires baking or barbecuing, I use the barbecue. I can bake using a dutch oven either on the cooktop or the barbecue. I just preheat the barbecue and use it like an oven. I even cook bacon on the barbecue as well as any foods that have strong odors that may linger such as seafood. Additionally, I have common appliances like a toaster, coffee maker, and crockpot. I can cook just about anything you can cook in a standard kitchen. Cook Smelly or Messy Foods as well as bake on the Barbecue. Q. Where does all your stuff go? A. I collect the pattern of dishes I have, so I have a ton! Rather than go with standard kitchen cabinets, which upon investigation would only store 2/3 of what I store now, I chose to go with open shelving for both the dishes and the pantry. I have found the shelves look really great, were economical, and are versatile. I can rearrange them as needed without too much hassle. Just a small portion of the pantry. Q. How do you store food so bugs don't get to it? A. I keep all my perishable items either in the fridge, freezer, or sealed in Mason jars. I also have a vacuum sealer that I swear by. Bugs can't get in to the glass containers and by vacuum sealing food prior to freezing it or storing it, the food stays fresher much longer. Mason jars and airtight plastic storage. Q. How big is the refrigerator in your tiny house? A. The refrigerator I chose is a 10 cubic foot model. The fact is I will freeze far more than I refrigerate, so I chose a smaller than average refrigerator. However, I do have a chest freezer I keep on the porch for putting by food. Q. How do you store pet food in a tiny house? A. I chose to store cat food in a container I found at a big box store. 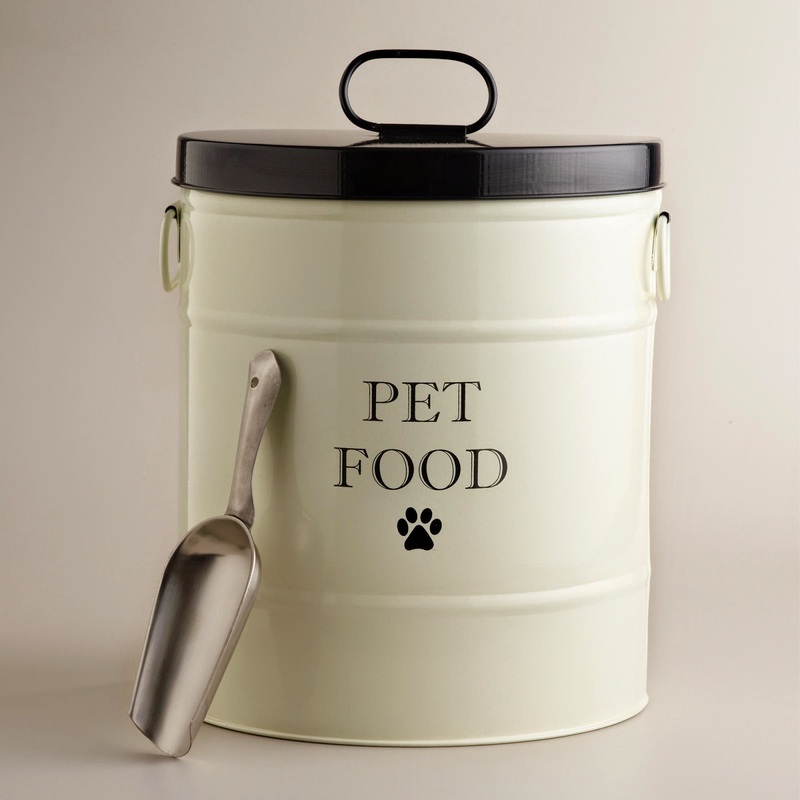 I added a galvanized trash can with a locking lid for the dog food. 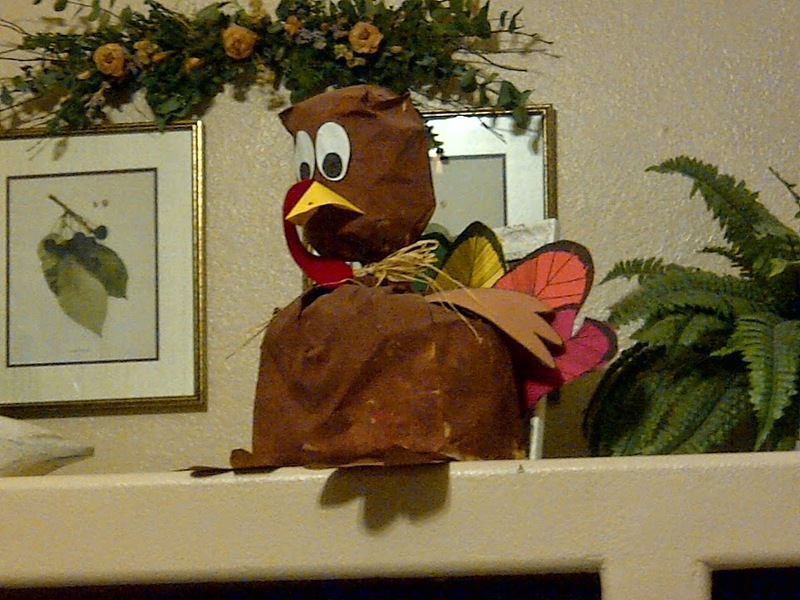 Both seal the food in to keep critters out and both fit the rustic theme I am going for with my decor. There are lots more questions folks ask me every day, but these are the ones I could think of off the top of my head. What questions do you have a about living in a tiny house? Last night temps got down to the mid 40's and it is a bit chilly as I sit here typing this. This morning there is a nip in the air and I am anticipating a nice hot cup of coffee as soon as it is done brewing. I haven't posted much in the last few days because I was out of town somewhere nice and warm. I thought I would share some photos from my whirlwind weekend in Florida this past week. I left at mid-day on Thursday, dove to Missouri and spent the night, then drove to Ft. Walton Beach the next day. We passed through Oklahoma, Arkansas, Missouri, Tennessee, Mississippi, and Alabama along the way. We, being the silly tourists we are, stopped at every state border and took a picture under the sign. It was great fun. After driving all that distance, I spent part of Friday, all of Saturday, and part of Sunday morning enjoying the warm sun, cool breeze, and soft white sands of Florida's Gold Coast. Saturday morning we got up and took our cups of coffee to the beach. It was a little chilly at first, but the coffee and the sunrise warmed us right up. I was excited to see dolphins feeding in the surf. I have never seen a dolphin in the wild. I can cross that off my bucket list. The sands of the Gulf of Mexico and the panhandle area of Florida are white and very fine. I can only describe it as soft on the feet. I can tell you though that I am out of shape for beach walking and my calves are still sore. We went for this weekend to go to a beach wedding. My friend Sharon and I had to stop off in Missouri to pick up the children and bring them so they could participate. I was lucky to be able to play hair dresser to Madison and I braided her hair in a fishtail. She looked beautiful. Little man had pants that were too long, so we had to figure out in a pinch how to hem them without any sewing supplies. Sharon had a glue gun she was fixing the bouquets with, so we just glued the hem up. It worked like a charm. The bride and groom were gracious hosts and the wedding was beautiful. The bride's dress was perfect for the occasion and she glowed like only a bride does. I took the opportunity to turn my lens on everything. I have to find that perfect shot to enter in the state fair this coming year. We had a great time and I couldn't have asked for more perfect weather. Tomorrow I will show some photos from the morning photo shoot and some better shots of the dolphins.